Optimism has increased that Washington could soon reach a deal with Beijing to end their protracted trade dispute, which has helped fuel this year’s 16% rally in the to near all-time highs. 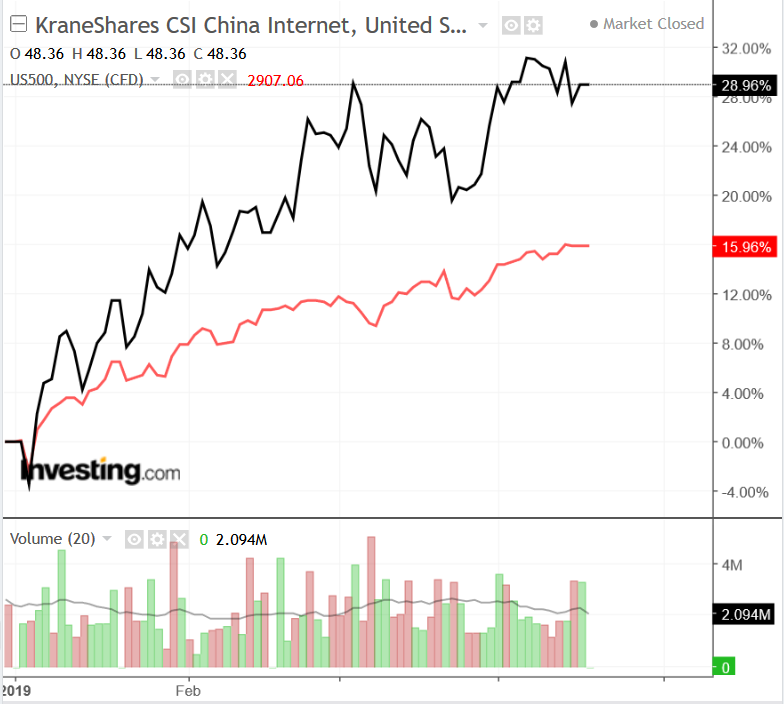 Indeed, the KraneShares CSI China Internet ETF (NYSE:) has gained 29% so far this year, significantly outperforming the broader market. 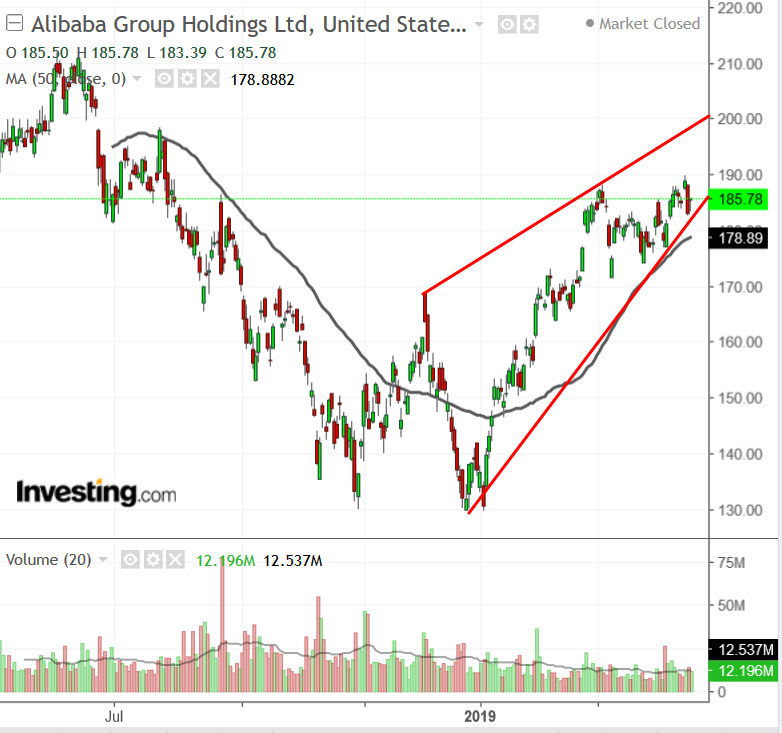 As such, we’re eyeing three China tech-related stocks, each poised to outperform in the weeks ahead amid renewed optimism for a resolution to the U.S.-China trade war. One is a proven global market leader in its field, the second operates an online website for automobile consumers, and the third is a recent fintech IPO, which has been on a tear since its trading debut last month. Perhaps no Chinese e-commerce company is more well-known than Alibaba (NYSE:). It dominates the market in China with a 58% share of online retail sales. Its e-commerce platform is underpinned by two marketplaces, Taobao, which is similar to eBay (NASDAQ:), and Tmall, which is more of a curated site, hosting brands like Nike and Zara. Indeed, shares, which closed at $185.78 yesterday, are up 35.5% since the start of the year. It reached a nine-month high of $189.79 on April 12. We continue to expect significant upside from here and recommend accumulating shares as the company is well positioned as a leader in its field. Alibaba next reports earnings on May 6 before the open. Consensus calls for EPS of $6.65 on revenue of $91.84 billion for the first-quarter. The company announced earnings of $5.73 per share in the same period on revenue of $61.93 billion. The leading online destination for car buyers in China, Autohome (NYSE:) provides automobile listing services, advertising services and dealer subscription services, among other things. Its ability to reach a large and engaged user base of automobile consumers has made Autohome the preferred platform for car manufacturers and dealers wanting to conduct advertising campaigns and publicize their services. The company operates its “Autohome Mall,” a full-service online transaction platform, to facilitate transactions for manufacturers and dealers. Further, through its website and mobile applications, Autohome also provides value-added, car-specific services including financing, insurance, used car transactions and aftermarket assistance. Shares of Autohome, which closed at $108.34 yesterday, have gained 38.5% so far this year. Despite the strong start to 2019, the stock remains below its all-time high of $119.50, hit last June. 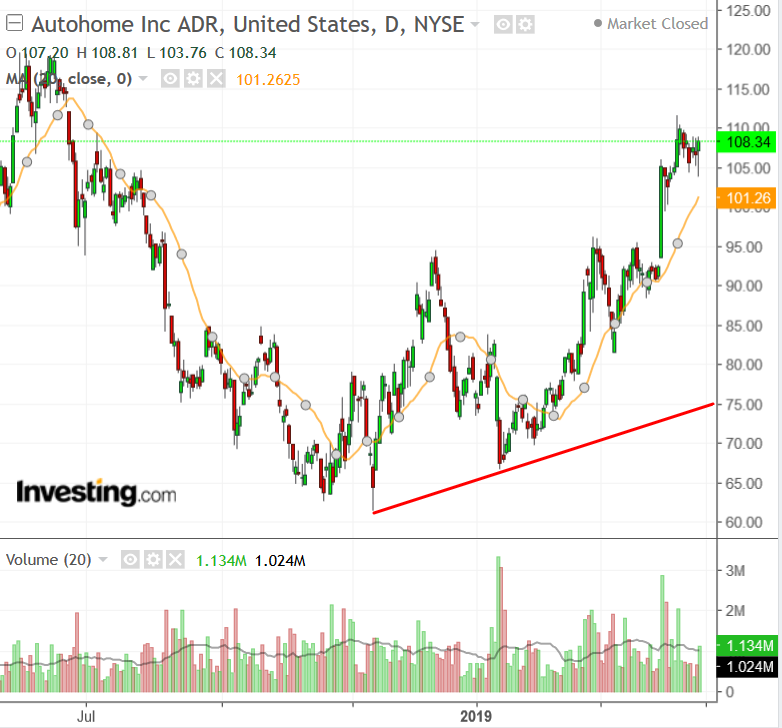 Autohome is scheduled to release first-quarter earnings ahead of the opening bell on Tuesday, May 7. Consensus calls for EPS of $5.02 on $1.58 billion in revenue. The company reported earnings of $0.69 per share in the and $1.29 billion in revenue. Up Fintech (NASDAQ:), which went public on March 20, is an online brokerage firm focusing on Chinese investors around the world. The company was launched to enable Chinese clients to easily trade overseas stocks on foreign exchanges, especially in the U.S., according to CEO Tianhua Wu. Shares of UP Fintech, known in Asia as Tiger Brokers, closed yesterday at $22, up 175% from the $8 a share at its IPO debut. The offering raised about $104 million for the company. 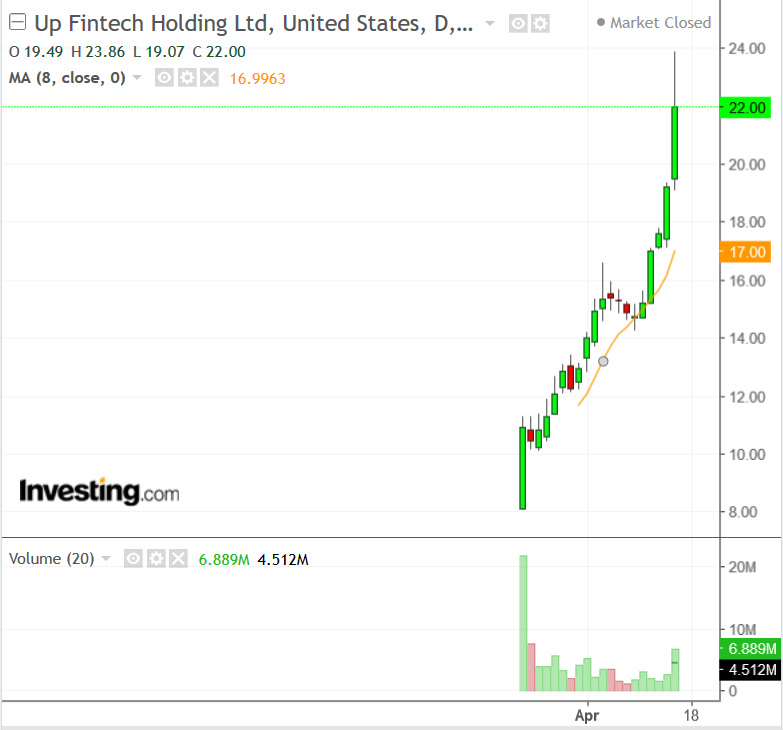 Lei Huang, CEO of UP Fintech’s American unit, said proceeds from the IPO will be used for general corporate purposes, global expansion, net capital requirements and to fund potential acquisitions. Strategic investors in UP Fintech include Beijing-based smartphone giant Xiaomi (HK:) and U.S. online brokerage Interactive Brokers Group (NYSE:). Wu said UP Fintech’s goal is to become similar to E-TRADE Financial (NASDAQ:), a U.S. brokerage firm that rose to prominence in the internet startup boom of the late 1990s. While UP Fintech is not yet profitable, it has had very strong sales growth. The company a net loss of $44.3 million in 2018, but revenue rose to $33.6 million from $5.5 million the year previous.